A complete basic undergraduate-level course in modern optics for students in physics, technology and engineering. The first half deals with classical physical optics; the second, the quantum nature of light. Many applications of the laser to optics are integrated throughout the text. Problems and answers. 170 illustrations. An applied mathematician by trade (with additional training in electrical engineering), I purchased this book to fill in background information on general optics in order to prepare me to read background material and scientific papers in nonlinear optics, a subject in which I am just beginning to undertake research.My familiarity with basic optics is limited to what I learned in 100-level physics many years ago--in other words, I know essentially nothing.The book really does deliver on the promise on the backcover that all that is needed is some "advanced mathematics (beyond calculus)" and "an intermediate course in electricity and magnetism." I found this book incredibly nice to read, with concise explanations that contain the proper amount of detail for both veteran readers and complete newbies (such as myself). The author doesn't bog the reader down with equations and long derivations, but he explains clearly how one step leads to another, allowing the reader to quickly fill in the details of the derivations, a perfect compromise for all audiences: those new to the field can learn by doing, yet with the proper guidance to prevent the process from being too frustrating, and experienced readers needing a refresher can merely read the results.Figures are well-placed and especially helpful, and notation is clear and not needlessly complicating. I highly recommend this book.Its value can't be denied; however, I'm certain that the book would compare favorably with other books costing several times more. This is an excellent book on fundamentals of optics, and optical devices. It provides a very good reference even for those who are not novices in the field of optics. The book covers a great deal of knowledge for only 12 dollars. Even though the book does not include many solved examples, and it is missing many important topics in optics, I am glad I have purchased it, since it is very affordable. 1) Title says: introduction. So don't imagine it covers every equation there is. Get Wolf's book if you like equations that much. 2) Short but concise on key subjects. To do that, you have to skip a lot of intro/background or equations, that's why there are references and citations (and better bricks/bug killers). 3) This is an intro book but also serves well as a refresher. This is intermediate level to advanced level for non-physicists, as it assumes good understanding of calculus. 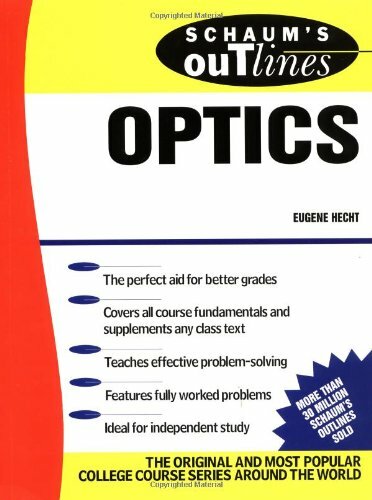 If you're studying optics in a college class using Hecht's classic text, or if you are an engineer who needs an overview of the subject, this is a good practical and economical introduction to the subject. However, be aware that this book is short on two components - details of derivations of mathematical formulas and illustrations. That is not to say they do not exist, it is just to say that at several points during the book I could have been aided in my comprehension by either an illustration or derivation that simply wasn't there. There are end of chapter exercises included, and there are solutions to selected odd problems in the back of the book. However, there are no details as to how those solutions were arrived at. If you are an engineer, the only way to really be sure that you understand a subject is to solve problems. Thus I suggest Schaum's Outline of Optics by Hecht for that task. Often the solutions to problems in that outline are the mathematical details that are missing in this book! This book is a little gem - and it costs next to nothing. It's a beautifully concise and remarkably clear introduction to the main principles of modern optics - the ones that you are going to need over and over again as you continue into the subject. I'm using this book right now for the fall semester. So far the book is good teaching me the basics of fiber optics. At the end of each chapter there are quizzes. There is no answers at the back because the answers are there when you read it. The only thing I didn't know about is you can view this book online for free. It's pretty much the same thing and they added more stuff about fiber optics (the more detailed stuff and how it works). It's a good book, get more, read them too. Spend some quality time in the lab. I strongly disagree with the comments of everyone uses software now so you dont really need an in depth understanding of geometrical optics. Personally I can get closer to real world optical parameters using a pencil and paper than many engineers and optical manufacturers can using software ....on optical designs that are not off the shelf designs. I ain't no Einstein either. uggh...engineers nowadays. How can you be an engineer and not want to, or feel the need to, sit down and draw out your designs and prove them on paper??? That mass in your head is the best computer around.....Y'all spend way too much time learning software and modeling and not enough time using your brains and hands. Software is a tool, a tool in the kit you use to help understand and to help prove a design or too just simply crunch numbers. I have a lot of fun drawing out my designs, thinking about what I am doing and what parameters are needed and what materials to use...doing some number crunching...knowing what the software should be doing and how it's doing it....isn't that why we choose these professions? Brains and hands...not keyboards and software. It is a descent book, has a lot of problems to choose from which would be great for a professor.However, it is far to wordy in so much of the material. Not to mention, it lacks heavily on the mathematics, and does not have examples (unless very on the rare occasion). Professors, I do not know the options out there, but this books is far to wordy and takes far to long to get to the point it needs to make.It makes it more difficult from a student's perspective to balance their time efficiently enough to contain all the information this book gives.It fairly often has weighted sentences that are not always directly appropriate for learning the material in one semester. I found this book alone not enough to actually learn the subject.In conjunction with good lectures, or with other resources, the subject could be adequately covered. I strongly agree with the details of the review by Michael Danzinger. Let me be frank, I didn't like this book much at all. It was very bizarre mathematically and the overall structure seemed really weird. It jumped around in difficulty a lot and in my opinion needs a good editor to fix it up. Some sections are way too short while others are just way too long. Also there are absolutely no examples!!!! This is just annoying since it's good to see the derivation of a theory but a nice application of the equations would be great and not put in the problems at the end of the chapter. I did enjoy some of his treatments various geometric optics and the topics of thick lenses was quite nice as well. But as other reviewers have said, I haven't been able to find a better intro optics book out there that isn't at too high of a level. Thus this is probablythe best lower level undergrad book in optics available. However I would be very much willing to have someone prove me wrong. I read this book thirty years ago in order to get up to speed on Fresnel diffraction and the Kirchhoff integral as discussed in John Cowley's seminal work "Diffraction Physics".Indeed, this book is recommended by Cowley as a necessary prerequisite.Goodman does a good job laying the groundwork for Fresnal diffraction, complete with a detailed exploration of the boundary conditions.After reading the first several chapters of this book, the reader should be ready to tackle Cowley. This is probably my favorite text book of all time.Dr. Goodman's writing is excellent, providing heuristic insight into complex concepts using a very readable style.He is the Richard Feynman of optics. And other than chapters specific to polarization, this book is entirely applicable to phased array ultrasound.For anyone whos works or studies in the ultrasound field, this book is a must, especially if you have an interest in acoustic beamforming.All the wave and Fourier concepts that apply to light also apply to ultrasound. 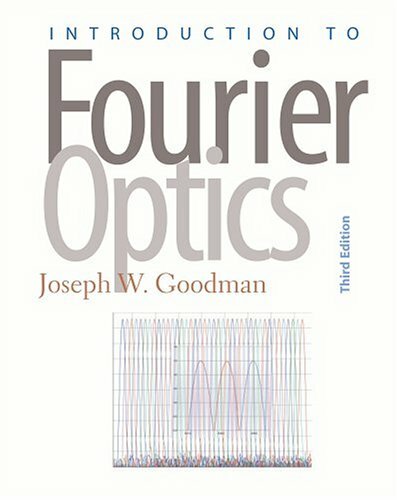 I use this book all the time as a reference for Fourier optics.It has useful tables of common Fourier transforms found in optics work and far-field diffraction patterns worked out for popular beam profiles. Amazing, a textbook that's easy to understand! I took a class in Fourier Optics and found this text to be indispensable.It explains everything very clearly and concisely, which is a minor miracle for a text at this level.I didn't have any particular background in optics, and was able to pick this up and understand every word. I do agree with the earlier poster that more 'physical' or graphical representations of concepts would have been useful as I tend to be a visual learner. Only the best will do - and this is it. Comprehensive and fully updated, this reader-friendly introduction to optics provides clear, concise derivations and explanations of optical phenomena, avoiding extraneous material. Updates material related to laser systems. Updated chapters on Optical Interferometery, Fiber Optics, and Holography. Introduces a broad range of new applications throughout, including liquid crystal displays, CCD's, CD and DVD Technology. Features a more intensive exploration of communication systems than in previous editions. Provides approximately 50 new problems and 50 new or revised figures. 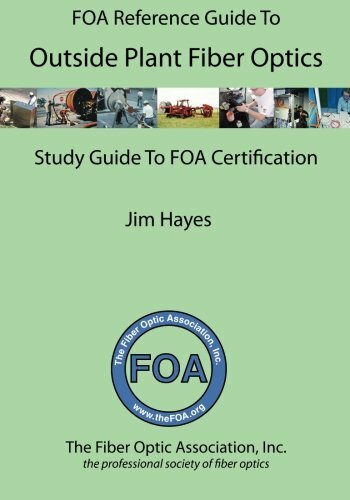 A general reference for optical industry practitioners. 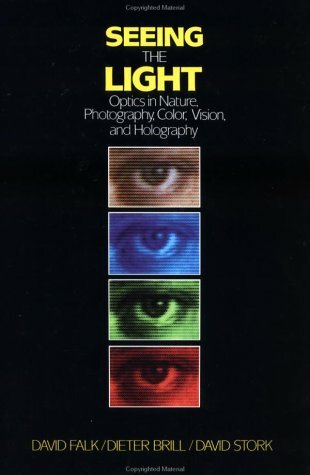 I used this book in an optics course, and I'd say that it was an okay book, not really something special. -The book is rather wordy, which means one looses one concentration rather fast. I'd have to admit as an actual optics major, this book served my purposes very well. There really is no way way you can go through introductory optics in 1 semester, which is how all the physics departments do it - it doesn't do the subject justice. These are all chapters that don't require Maxwell's Equations at all, even if you knew them.The optical properties of material chapters deals with Maxwell's Equations more or less for the entire chapter. The laser and subsequent chapters also give you a VERY BASIC flavor of expect in more specialized books. If I had to recommend a book for actually learning the material and that has worked out problems, this would be the one. Born and Wolf is great, but only as a reference, and still there are flaws in that book as well. Jenkins and White or Schaum's Outline for Optics might be useful supplements, as I used them from time to time. 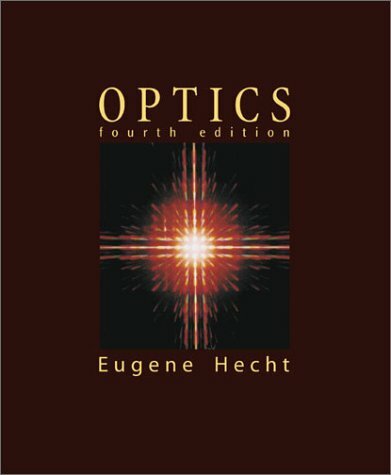 Hecht is not a good book to learn out of, but a good way to learn what optics is all about. 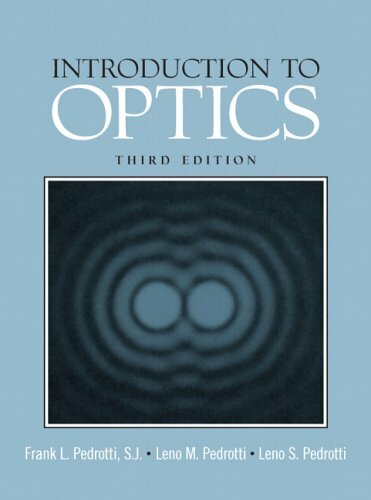 I took a course in Optics from the author and he used his own book.It was awful.I had to acquire several other optics books to actually learn the material.If you're looking for a good optics book, look elsewhere.Hecht and Zach or Klien is a much better option. I have given recitations for a course when I was a TA. For my own reference it was very good concerning many matters, when one really needs the problems like reducing aberrations or like multilayer thin film optics or may be even non linear optics, this book is a very honest written book. But I do not know if it is a good idea to talk about aberrations for the people who do not have much idea about Gausssian geometrical optics for instance. Its level is not a graduate level, but, you know, for young people, they do not want to hear about the problems that they may face in life, untill they really do. I still have this book on my shelf, even after shifting to different topics. To me it is a compact and a real life book. Does not talk about myths, tells you the truth of life in optics. But of course Hecht s book is better may be as an introduction, gives a better overall map of the field. If you will have several optics book in your life this is one of them. But only if you work out the problems and think about the reason why they were asked. Every problem in this book is about a real life case in the optoelectronics laboratory and not about a fantasy. It is helpful supplements to a standard text book with lots of solved problems, mainly if you have the authortext book with the same name. In some issues can serve as a text book. It has well done organization. In some topics elucidate some matterbecause provide numerics examples. I highly recommend it. More advanced textbooks will be easier to read after you finish this book. The price makes it definitely a good bargain! This is a perfect supplement to the Optics book by Hecht. Taking a senior optics class at UTD and the schaums book had some really good key examples to help with HW, concepts in general. 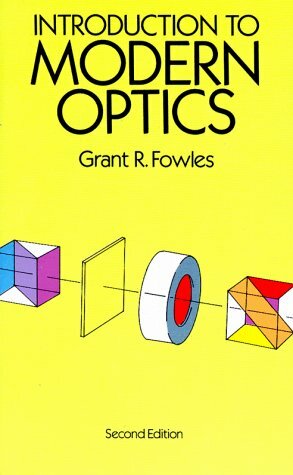 This is a great book for somebody who wants to learn basics and get a feeling about optics. Helped me with the exam too. Nonlinear optics is the study of the interaction of intense laser light with matter. The third edition of this textbook has been rewritten to conform to the standard SI system of units and includes comprehensively updated material on the latest developments in the field. 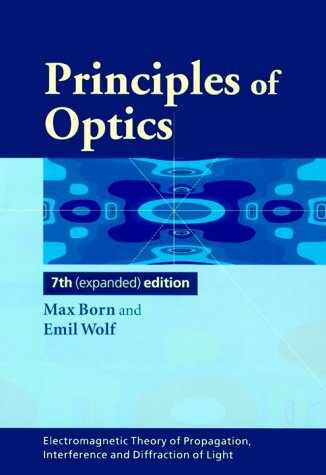 The book introduces the entire field of optical physics and specifically the area of nonlinear optics.It focuses on the fundamental issues including the electromagnetic origin of optical phenomena, the quantum mechanical description of the optical properties of matter, the role of spatial symmetries in determining the optical response, causality and Kramers Kronig relations, and ultrafast and high intensity optical effects.The book also covers applied aspects of nonlinear optics such as harmonic generation, the operation of parametric oscillators, optical switching, photonics, materials issues in nonlinear optics, and processes such as laser damage that can restrict the use of nonlinear optics. Nonlinear Optics appeals to a wide audience of physics, optics, and electrical engineering students, as well as to working researchers and engineers. Those in related fields, such as materials science and chemistry, will also find this book of particular interest. * Presents an introduction to the entire field of optical physics from the perspective of nonlinear optics. Thank the author for using the SI unit, not the Gaussian unit, in the third edition! The book I ordered was listed as "good" condition and when I got it, it was like brand new... excellent condition!Fast delivery too. I have had this book for about a year. I use it often. People are also borrowing it. It is very well written and covers subjects well. It is very readable. I am very pleased with this book. This book is a comprehensive work including all the regular nonlinear phenomena like SHG, SFG, DFG, FWM, Raman and Brillouin Scatterings, and so on. Quantum mechanical theory of nonlinear optical susceptibility is on chapter 3 whereas chapter 6 is about nonlinear optics in two-level approximations which contains sections on optical Bloch equations and Rabi oscillations. Finally chapter 13 is on ultrafast nonlinear optics. We have to say that Professor Boyd has done a wonderful job on this book, since anyone from senior research scientists to first year graduate students all can refer to it.This book reminds me of Jackson's book on E &M in the sense that although you might notget `it'at that exactmoment you canalways count on it toshow the correct way to tackle. 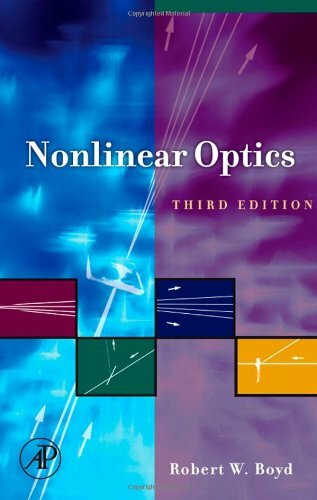 All in all, if you are looking for a book on nonlinear optics this is the one you should have. Yes - all classical (linear) optical concepts are in here, and yes, it's the 'bible', but it's very dated in its content, style and references, generally, and not very practical to use. I wish Hecht - or someone like him - would re-write this classic as a more advanced version of his book. Amazing book. It's the bible of geometric optics. Have everything you might need. Needs a little previous knowledge, but which book doesn't? I read this book in the late sixties, when some of my fellow engineers built and tested an acoustic lens for a developmental company. Born & Wolf were well-acquainted with antenna aperture theory, and were among the first to write that the human eye could resolve 5X better than aperture theory would predict. This they credited to involuntary eye movements called flicks and saccades, which when combined with the brain's ability to do signal processing, was able to produce much better resolution than would have been predicted by the diameter of the retinal rods. In many ways the book gives testimony to God's wonderful gift of vision with color, depth, clarity, and order. It is just a rare book on physical optics based on Maxwell equations. Rarely a book states the assumptions,the validity of the equations, the principles and how the equations arrived. Certainly, it is a great book for postgraduates and researchers in physical optics not so for undergraduate students who don't want to go through all the mathematics. This book is a classic with all problems associated. Half of the reference quoted have been written before the WWII. Very useful if you like to quote original papers. This book cover most topics of the classical optics but hardy cover modern topics. This book is for beginers... Any technician who worked few months on fiber optic knows about everything in that book. However, if someone never worked with fiber optic, this is a very good introduction... If the title was: "... an introduction..." I certainly rate this book 5 stars. 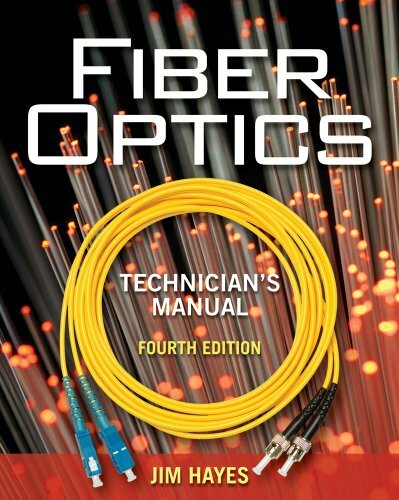 I Ordered the manual Fiber Optics Technician's Manualhoping that it would have new ideas and latest technology included and was dissapointed in both departments. It covered fiber optics thoroughly up to the 1970/80's and for anyone that has been active in the field of fiber optics this is actually a waste of money. I passed it on to my employees hoping that at least they would find some benefit but short of just getting some more detailed information I seriously doubt whether they could benefit from this in the practical enviroment. To conclude this is a product for someone that is starting out on fiber optics and should be advertised as such. This book is designed predominnantly for folks who will be working with Multimode fiber and predominantly inside plant.It lacks significantly when it comes to outside plant work and single mode fiber.This book was written by Mr. Hayes with the focus on his FOA CFOT structure training and that is again predominantly focused on mulitmode cable and field terminations, rather than single mode. The popular optics review manual, Last-Minute Optics: A Concise Review of Optics, Refraction, and Contact Lenses, has been revised and updated into a Second Edition. This unique resource boils down the overwhelming subject matter of clinical optics and refraction, helping the ophthalmologist cover the essentials in a single review manual. The content is based upon the practical experience of two clinically active experts who lecture on ophthalmic optics around the world. This updated Second Edition by Drs. David G. Hunter and Constance E. West includes new questions added to selected chapters and a new chapter covering refractive surgery, as well as a key chapter that helps you evaluate patients with symptoms related directly to optical or refractive concerns. The complex concepts of optics are revealed in easy-to-understand explanations enhanced by simple illustrations. Last-Minute Optics, Second Edition allows you to test your knowledge while increasing your understanding of optics. Designed in a clear, concise, question-and-answer format, this book allows for self-assessment and a chance to test your understanding before you read the answer. 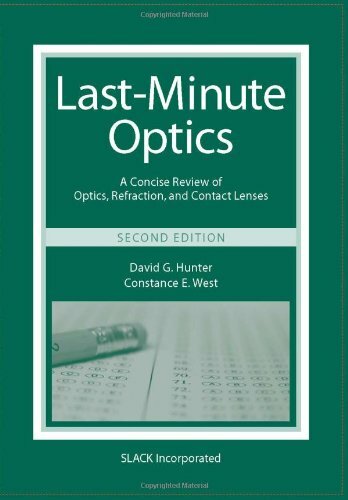 Whether you’re an ophthalmologist, ophthalmic technician, resident or student, reviewing the optics facts and concepts is easier with Last-Minute Optics: A Concise Review of Optics, Refraction, and Contact Lenses, Second Edition. it is not a standard text, not meant to be. 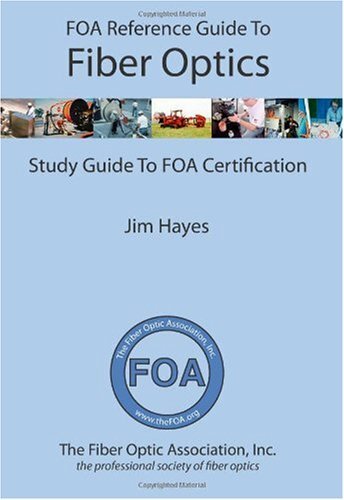 but it is a very practical review with practical information and applications not found in many standard texts. the information is also pretty current and accurate, albeit paltry. definitely a good read the month before the exam, and the best review material for those finished with the exams. a nice fresh approach to a tedious task all in all. good one! 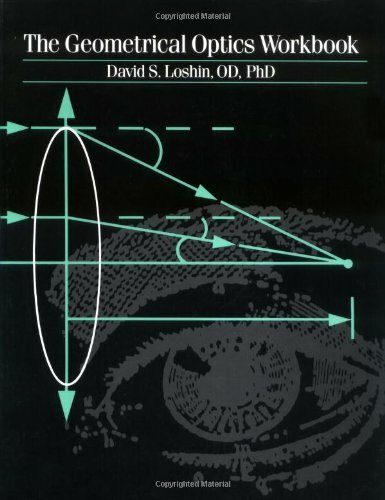 Throw away the Academy of Ophthalmology's optics book.This concise text is all you need.If you read it carefully, do the problems and really learn what it teaches, you will score very well on the OKAPs and board exams. As a reference book, this little handbook falls short. As alearning tool it is also lacking, with little detail or helpfuldiagrams. However, as a study tool, this review should serve the student well if he/she had a real reference from which to learn.That is, in fact, what it markets itself to be -- a last minute study review -- so no false advertising here. Fiber optics plays a key role in communications, as well as in broadcast and cable systems. Engineers working with fiber optics as well as newcomers to the industry will find the third edition of this reference guide invaluable. It will help the reader develop a solid understanding of the underlying principles of this rapidly changing technology as well as its essential practical applications.The text is thoroughly indexed and illustrated. Learn about Fiber Optics Fast! 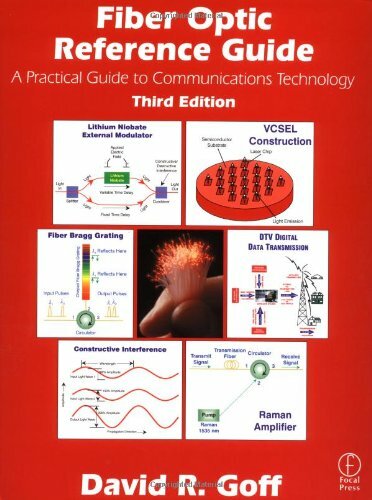 This book is an excellent resource for getting up to speed on fiber optics quickly. It does a good job at explaining the basics of fiber cables, lasers, modulators, receivers. If you know nothing about fiber optics, you can read this in a weekend and get an overview of most of the field. This book doesn't go into the mathematics or physics much. If that is what you are looking for, then the book isn't what you want. I highly recommend this book. This is an excellent overview covering a wide range of fiber optic system-related topics. It is particularly useful for the working engineer, because it covers the basic information succinctly and without complex mathematical analyses. End-of-chapter references point the reader to sources of more detailed information. From the basics of optical waveguides, the operation of passive and active devices, and system design considerations - this guide provides an excellent 'first step' on the path to clear understanding. The best Introduction to fiber optics I have seen so far. A must own for the fiber optic neophyte. I purchased this book, "Introduction to Fiber Optics" by Crisp and "Understanding Fiber Optics" by Hecht to get up to speed on the technology.I work in finance, and am not an engineer.I found this book to be the most clear of the three, and by far the easiest to understand.This book had better diagrams and used better analogies to explain the technology than did the other two books. When I took the course this Field Guide is based on, I walked away with a binder full of hand-written notes, which I probably never looked at again.15 years later, I keep this (and about 4 other Field Guides from the same series) within arm's reach in case I don't feel like deriving a paraxial equation or searching for the scotopic response function or digging up some other not-quite-trivial piece of information.One nice feature is that each page is self-contained and devoted to a single topic.Another nice feature is the spiral binding, so it stays open. 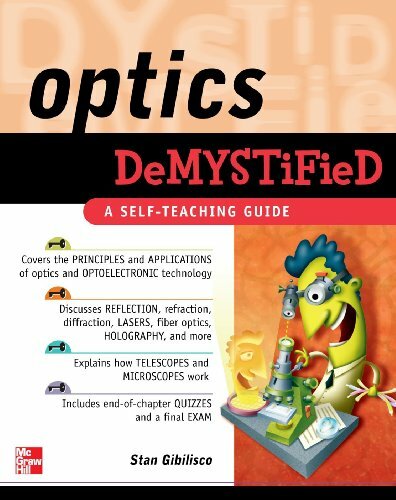 I had this book as a text for a class and as a text book it stinks, I give it 1 star.However it isn't a text book but rather a reference book.As a reference book I give this 5 stars.It is great if you need a little refresher on optics but this is not something to learn optics from. 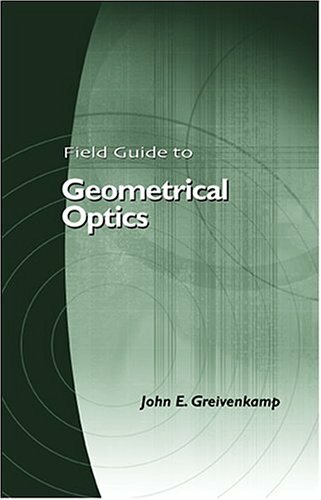 Dr. Greivenkamp has published an excellent reference guide for anyone interested in optical systems. It is an invaluable resource for those of us taking his OPS 201-2 classes at the University of Arizona. He presents the topics straight forward without all the mumbo/jumbo found in many other geometrical optics books. It's a very handy and quick reference guide that includes most if not all of the optical instruments. Fox does a great job explaining a complex and dense field from an intuitive and experimental standpoint. I read this book after one term of 1-D introductory Q.M. and everything made sense. The experiments and set-ups described throughout the book are a great tool and were particularly handy since I was using the book to get ready for a summer internship in a Quantum Optics group. The only downside is that the book is quite lacking from a theoretical standpoint. If you are a bit more comfortable with Q.M., say at the level of Shankar, Liboff, or Sakuri, try Knight instead. Nonetheless, this is a great book. This is our textbook and is easy to understand. It also has answers for the exercise questions. That helps a lot. 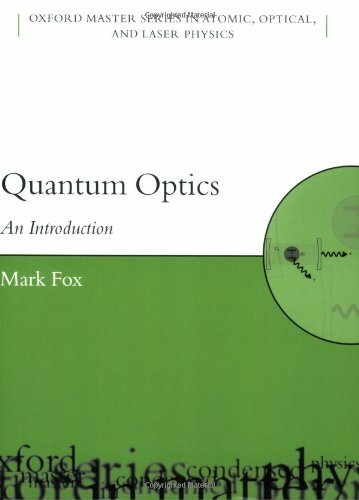 At last we have a text that provides a comprehensive introduction to quantum optics for the beginner - both theory and experiment - and one which takes you through many of the most recent concepts and potential applications in computation, cryptography and teleportation etc. A feature of this text is the clear explanations and carefully explained jargon - it's NOT just mostly a collection of math like some other supposedly introductory texts. If you want to find out what quantum optics is all about - this is a great book to start with. 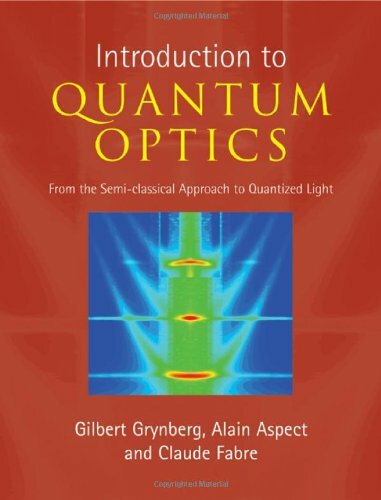 I developed an interest in quantum optics in my last year of undergraduate school but I became discouraged with it since every book that I picked up on the subject was esoteric and too involved for an introduction.It seemed as if NONE of the quantum optics textbooks available were appropriate as an introduction.But then I found this book. Although not as mathematically intensive as I was hoping for it to be, it explains the physics very well.And although it doesn't compensate for many years of post-graduate study, I was able to better understand research papers in quantum optics due to this book. The book follows a rather traditional approach to developing quantum optics...first starting off with a discussion of important results in electromagnetism, classical optics, and quantum mechanics...then progressing to the theory of photons (discussing photon statistics, coherent states, and second quantization (with regard to photon number states)).Furthermore, it discusses the essential "backbone" of quantum optics (light-matter interactions) and then applications of quantum optics (quantum computing, quantum entanglement, etc.). I broke the rules and skipped ahead to the applications section and I must say that everything seems to make sense because of Fox's ability to convey difficult ideas in a simple, easy-to-understand manner. I received a high quality product for a fair price -- it also arrived early which was a bonus!!! One of the best science textbooks I've ever read.Clearly written and interesting to read.Heavy on concepts, light on math.Diagrams are simple but effective.It's rare to see a physics book as approachable as this one.As an amateur photographer and research microscopist, I love this book.Some parts of the text are a bit outdated (remember it was published in 1986), but the vast majority is valuable information.This is a great tool for physics students and teachers. The book arrived quickly and in the condition that was specified. No issues, would use this seller again. Particularly for a budding Optometrist, this book allows the Optometrist to be acquainted with all the fine arts of optics and the like. Great Section on Nobel Prize Winner, Charles K. Kao! Charles Kao recently won the 2009 Nobel Prize in Physics "for groundbreaking achievements concerning the transmission of light in fibers for optical communication. "Hecht does a terrific job giving a thorough description of Kao's work that won him this award. It's great book for those who interests in where it came from. Especailly I would like to note the style of narration as an example of a deep insight into the issue of development and early research works. Unfortunately, the story is ended in the begining of the 90th and whole decade is omitted. It would be better if the story of photonic components development was included but it's a matter of next edition of this book. As conclusion, I recommend this book to read for everybody who is involved into the field of Fiber Optics. 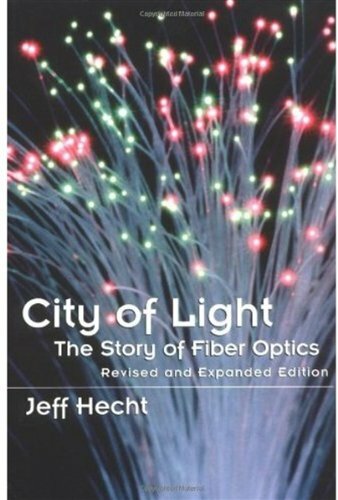 Fiber optics, the backbone of local and international communications and of the Internet, seems like a new technology, but in this comprehensive history of the field Jeff Hecht describes the Victorian origins of light guiding via jets of water. In the first half of the 20th century a number of researchers independently discovered flexible glass fibers, and with the introduction of the laser in the 1950s long-distance optical communication became a possibility. The main section of the book focuses on the work of researchers in Britain, Japan, and the United States from the 1950s through the 1980s as they overcome many technical problems and develop the beginnings of modern fiber optic cables, documenting the failures, the dead-ends, and the ultimate success in the early 1980s. Extensively researched and annotated, with much material from primary sources, City of Light is accessible to the non-technical reader, yet has enough detail and links to additional sources to satisfy students of engineering history. Good explanation of "where it all came from"
Hecht does a good job of explaining where the technology of fiber opticscommunications came from.His book is not an explanation of how fiberoptics communications works, but a history.I have a reasonably goodbackground in fiber optics communications so it's difficult for me to judgewhether someone who knew nothing about it would find it easy to follow,although I think they would. I would particularly recommend the book tofiber optic techies - it really makes the technology more meaningful whenyou understand how the technology developed.A fine job by a good writer -very close to five stars. And if you're technically oriented and wantmore knowledge of fiber optic technology, I'd recommend "OpticalNetworks" by Ramaswami and Sivarajan. Are you in the dark when it comes to understanding the science of optics? Now there's a glimmer in the gloom! Optics Demystified brings this challenging topic into focus. Written in an easy-to-follow format, this practical guide begins by covering the nature of light, the electromagnetic spectrum, reflection, refraction, and color dispersion. You'll move on to common optical devices and effects, lasers, and optical data transmission technology. Industrial, medical, and military applications are discussed, as are exotic optics such as holography. Detailed examples and concise explanations make it easy to understand the material, and end-of-chapter quizzes and a final exam help reinforce learning. Simple enough for a beginner but challenging enough for an advanced student, Optics Demystified illuminates this vital physics topic. ... in other words, this is a bird's eye view. This is the kind of book that you buy your high school student or freshman college student before they ever get into the physics. This book does discuss a little of the physics - and does so amazingly well considering the high level that the discussion is taking place. You get a more scientific view of the nature of light than you would from the old favorite Seeing the Light: Optics in Nature, Photography, Color, Vision, and Holography, which has more details but is more artistic in its viewpoint, in my opinion. The book is not all prose, there are some elementary problems to solve, almost all of them involving using equations that have already been given to you in the chapter in question, but it does give you the very beginnings of an appreciation for the quantitative side of things. In summary, before you or your physicist-to-be son or daughter gets Hecht's Optics dumped on their desk and are up to their armpits in differential equations, Bessel functions, and Maxwell's equations, try this book first and appreciate "the what and why" of optics before you are immersed in the details of "the how". It's a quick easy read. Since the publication of the second edition of Principles of Adaptive Optics, the developments and applications in this area have increased tremendously. Observatories are now producing outstanding science through adaptive optics technology; components, such as micromachined deformable mirrors and very low noise detectors, are revolutionizing the field; and the industrial and medical arenas are harnessing the capabilities of adaptive optics tools in free-space laser communications, laser-induced fusion, and retinal imaging. Although the complexity of these applications has intensified, the principles essentially remain the same. 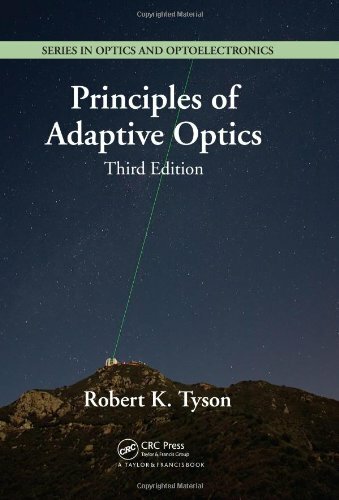 Principles of Adaptive Optics, Third Edition offers a comprehensive guide to the systems, components, and processes of adaptive optics. It covers the principles used to extract information from beams of light and improve the performance of optical systems by correcting distortions and aberrations. Condensing the vast array of literature into one accessible source, this edition incorporates recent developments and adds many new references. It discusses how the principles are applied to astronomical imaging systems, retinal imaging, and beam propagation systems. The book logically progresses from determining the sources of aberrations to designing and analyzing systems to describing major subsystems, such as wavefront sensors, correction devices, wavefront reconstruction, and real-time controls.